Your home should be a place where you can relax and feel comfortable. But this is possible only when the uninvited guests are beyond the threshold. Burglars prefer windows and balcony doors in easily accessible places, such as the first floor. In most cases, in case of penetration the flap is being broken. The windows with burglar findings will secure your room. Roto NT findings in standard configuration have basic security. If you need a higher level of anti-burglary, additional mechanical and electronic anti-theft elements can be integrated at any time – up to the highest level of security and protection against burglary or dangers such as fire, gas leak or water. 1. Steel hook for windows and balcony doors. Like riegels, hooks from heavy alloy come to response reliable keepers in the frame and are fixed there for the most reliable protection. Borrowed from the field of burglar door, the hook design makes the window or balcony door as safe as the doors. 2. Central locking with counter rotating. Two mushroom pins come from both sides into the burglar strike simultaneously. This locking mechanism provides an effective protection against attempts to break the window, forcibly moving perimeter findings from outside. Window handles, lockable with the key, prevent tampering attempts. Window handles Secustik ® – the best form of security in tamper resistance, since it is not visible. No need to use the buttons or keys that have a negative impact on the style of the handle. Burglar-resistance pins provide a special security and reliability. Burglar-resistance pins in combination with strikes provide a high degree of safety. Basic protection against the use of physical force, such as kicking, stroke by shoulder, etc. WK1 * – 1 protection class. Burglar locking strikes and corner switches with burglar pins, which have mushroom and height-adjustable head, protect your window or balcony door against pressing on the four corners of the flap. Protection against drilling and handle with lock additionally increase the degree of protection. Protection against such tools as screwdriver, plier and wedge. WK2 * – 2 class of mechanical protection is based on the first class. Burglar locking pins on the flap perimeter further enhance the window structure. 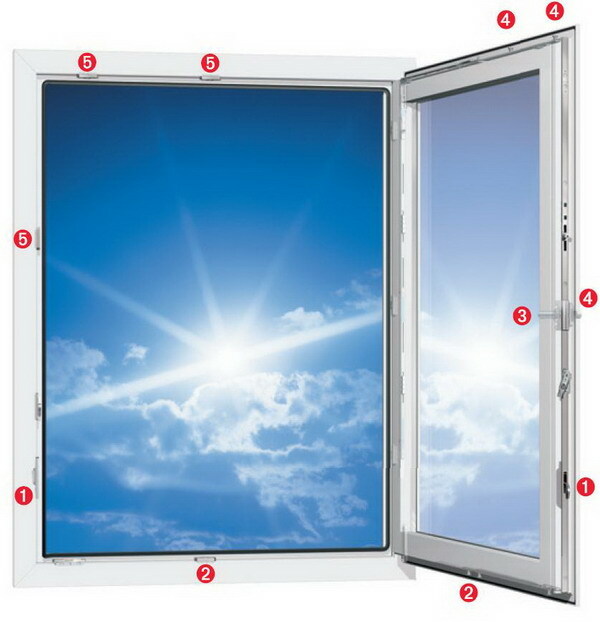 This means that the fittings and window frame can withstand increasing loads. Protection against braking-in with using crowbar and scrap. WK3 * – 3 protection class. . In addition to the existing protection classes WK1 and WK2 burglar locking pins there are added burglar locking pins on the corner switch and scissors on the flap, that greatly reduces the distance between locking pints and further hampers efforts of braking-in.